3استادیار، گروه مشاوره، دانشگاه آزاد اسلامی، واحد اراک، ایران. 4کارشناس ارشد، گروه مشاوره، دانشگاه آزاد اسلامی، واحد اراک، ایران. مقدمه: با توجه به اینکه عدم احساس کارآمدی فردی و احساس تعلق به مدرسه از عوامل پیش‌بینی کننده افت تحصیلی در تحصیل به شمار می­رود، پژوهش حاضر باهدف تعیین اثربخشی مشاوره شناختی -رفتاری به شیوه گروهی برافزایش خودکارآمدی تحصیلی و احساس تعلق به مدرسه در دانش‌آموزان دچار افت تحصیلی انجام شد. مواد و روش­ ها: روش پژوهش نیمه تجربی است. 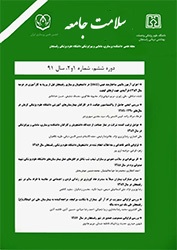 جامعه آماری این پژوهش شامل کلیه دانش‌آموزان دچار افت تحصیلی در مقطع راهنمایی شهرستان شهریار بودند. از این ‌بین، ۳۰ نفر با استفاده از روش نمونه‌گیری تصادفی انتخاب و به دو گروه ۱۵ نفری مداخله و کنترل تقسیم شدند. گروه مداخله ۱۵ ساعت تحت مشاوره گروهی شناختی -رفتاری قرار گرفتند. ابزارهای اندازه‌گیری عبارت بودند از: پرسشنامه خودکارآمدی Morgan, 1999) & Jinkes) و پرسشنامه احساس تعلق به مدرسه (Berry, Betty&Watts, 2004) . به‌منظور تجزیه‌وتحلیل داده­ها، از تحلیل کواریانس استفاده شد. یافته­ ها: نتایج نشان داد بین گروه مداخله و کنترل تفاوت معنی­داری وجود دارد و مشاوره شناختی- رفتاری برافزایش خودکارآمدی تحصیلی و احساس تعلق به مدرسه مؤثر بوده است (0001/0p=). نتیجه­ گیری: بر اساس نتایج می­توان به‌منظور ارتقای خودکارآمدی تحصیلی و همچنین افزایش احساس تعلق به مدرسه، از مشاوره شناختی -رفتاری به شیوه گروهی استفاده کرد. 1Assistance prof, Dept of Counseling, Farhngian University, Tehran, Iran. 2Associate prof, Dept of Counseling, Islamic Azad University, Komeyn, Iran. 3Assistance prof, Dept of Counseling, Islamic Azad University, Arak, Iran. 4MSc, Dept of Counseling, Islamic Azad University, Arak, Iran. Introduction: Considering that the feelings of lack of individual self-efficacy and belonging to school are of the predictors of academic failure in education, the purpose of this research was to investigate the efficacy of the recognizable behavioral consultancy as the gregarious method on improving the educational self-efficacy and sense of school belonging among the students with educational failure. Materials and Methods: In this semi-experimental study, among all guidance school students with academic failure in Shahriar City, 30 students were selected using accidental sampling method. They were then divided into two groups of 15, experimental and control groups. The experimental group received the cognitive behavioral counseling for 15 hours. The measuring tools consist of the Berry, Betti and Watt’s scene of belonging survey and the Ginkez and Moorgan’s self-efficacy questionnaire both with reliable recognition. Results: The results of this study indicated that cognitive behavioral counseling improved significantly the educational self-efficacy and the sense of school belonging (p=0.0001). Conclusion: According to the results of the present study, cognitive group counseling therapy may increase academic self-efficacy and also promotes the sense of belonging to school in schoolchildren. Dickhäuser C, Buch SR, Dickhäuser O. Achievement after failure: The role of achievement goals and negative self-related thoughts. Learning and instruction 2011;21(1):152-62. Dante A, Valoppi G, Saiani L, Palese A. Factors associated with nursing students' academic success or failure: a retrospective Italian multicenter study. Nurse Education Today 2011;31(1):59-64. Bandura A. Self-efficacy mechanism in human agency. American psychologist 1982;37(2):122-42. Wolters CA. Advancing Achievement Goal Theory: Using Goal Structures and Goal Orientations to Predict Students' Motivation, Cognition, and Achievement. Journal of educational psychology 2004;96(2):236-50. Seo M-g, Ilies R. The role of self-efficacy, goal, and affect in dynamic motivational self-regulation. OBHDP 2009;109(2):120-33. Bouffard T, Bouchard M, Goulet G, Denoncourt I, Couture N. Influence of achievement goals and self‐efficacy on students' self‐regulation and performance. IJP 2005;40(6):373-84. Carroll A, Houghton S, Wood R, Unsworth K, Hattie J, Gordon L, et al. Self-efficacy and academic achievement in Australian high school students: The mediating effects of academic aspirations and delinquency. Journal of adolescence 2009;32(4):797-817. Graham S. Self-efficacy and academic listening. JEAP 2011;10(2):113-7. Ferla J, Valcke M, Cai Y. Academic self-efficacy and academic self-concept: Reconsidering structural relationships. Learning and individual differences 2009;19(4):499-505. Saracaloğlu AS, Dinçer IB. A study on correlation between self-efficacy and academic motivation of prospective teachers. Procedia-Social and Behavioral Sciences 2009;1(1):320-5. Bandura A. Social cognitive theory: An agentic perspective. Annual review of psychology 2001;52(1):1-26. Dweck CS, Leggett EL. A social-cognitive approach to motivation and personality. Psychological review 1988;95(2):256-73. Hoy A. Essays on teaching excellence: Toward the best in the academy. Self-efficacy in College Teaching 2003;15(7):8-11. Kaplan A, Maehr ML. Achievement goals and student well-being. CEP 1999;24(4):330-58. Bandura A. Perceived self-efficacy in cognitive development and functioning. Educational psychologist 1993;28(2):117-48. Zimmerman BJ. Self-efficacy: An essential motive to learn. CEP 2000;25(1):82-91. Turner JA, Anderson ML, Balderson BH, Cook AJ, Sherman KJ, Cherkin DC. Mindfulness-based stress reduction and cognitive behavioral therapy for chronic low back pain: similar effects on mindfulness, catastrophizing, self-efficacy, and acceptance in a randomized controlled trial. Pain 2016;157(11):2434-44. Urbanski J. (dissertation).The relationship between school connectedness and bullying victimization in secondary students. Florida:University of South Florida; 2007: 67-7. Cheek JR, Bradley LJ, Reynolds J, Coy D. An intervention for helping elementary students reduce test anxiety. Professional School Counseling 2002;6(2):162-4. Beaty B, Brew CH, Watt A. Measuring Student sense of Connectedness with school. Australian Association for Research in Education Annual Conference ;2004 Nov28 – Dec2; Melbourne, Australia.2004: 22-1.